Pumpkin muffins are a staple in our house during October. We like to eat them both for breakfast and as a pumpkin dessert. If I don’t make them the last week of October, there is a disappointment in the air. My husband and I had our wedding in late October, and I used this recipe for our cake. Halloween would have been awesome an awesome date, but we were married the day before. Hey, the kids have to trick-or-treat at some point! Anyway, instead of freezing the wedding cake and eating it after being frozen for a year on our anniversary, I make muffins or cupcakes with the same recipe each year. What a strange tradition. 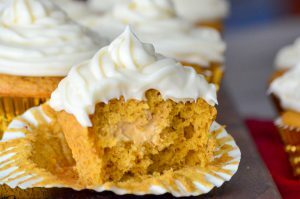 I like to dress these pumpkin muffins up by transforming them into pumpkin cupcakes. I add cream cheese icing on top. 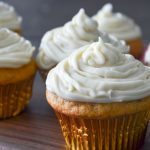 If you want to go even further, you can use this pumpkin cream filling recipe and fill the pumpkin cupcakes as I do. Use whichever combination works for you. 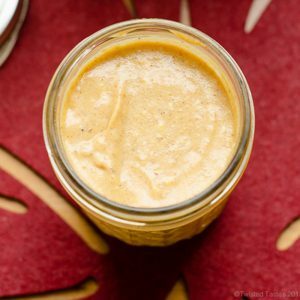 My kids like to use the leftover pumpkin cream as a bagel topping. Posting this recipe after all these years in November is not a coincidence. I just made these again the other day…well the other week. If you look closely, you can see one of my anniversary gifts hidden in the photos. My husband gave me a couple of engraved and stained cutting boards. Rather than put the gifts up so they don’t get ruined, they were incorporated as photo props. I could make pumpkin desserts throughout the fall season. Now that we’re in Minnesota, it seems like fall is only a couple weeks long and we moved right into winter. I guess I’ll be making this as a pumpkin dessert in the winter too. My niece just asked for pumpkin muffins (well a pumpkin cake) for her birthday in December. A pumpkin dessert that wraps the house in the scent of the fall season, enticing your family to request it each year. Preheat the oven to 350 degrees Fahrenheit and spray two cupcake pans with non-stick spray or use cupcake liners. Combine all the dry ingredients into a large bowl and whisk together. This includes the cake flour, white sugar, salt, allspice, nutmeg, cinnamon, baking powder, and vanilla pudding mix. Make a well in the center of your dry ingredients and add the butter, canned pumpkin, oil, sour cream, and vanilla extract. Mix for about 1 minute or until most of the ingredients are incorporated. To the mixture, add the eggs one at a time. Next, slowly add the water. Continue mixing until fully incorporated. The batter will be thick. Fill each cupcake pan with batter about halfway to two-thirds of the way full. Bake in a preheated oven for 22-25 minutes or until a toothpick inserted into the middle comes out clean. Allow the muffins to cool before filling. Find the pumpkin cream filling recipe here. Note: Nutrition facts do not include the filling. 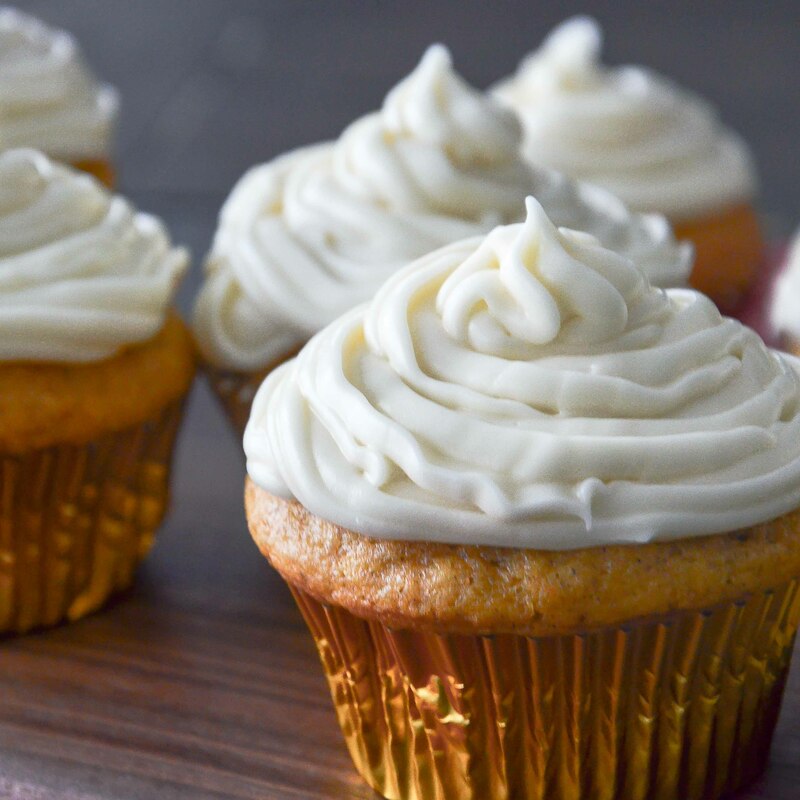 These pumpkin cupcakes look fabulous. I like the option of filling them with pumpkin cream filling too. Will definitely be making these this week. Emily, I’ll have to admit…sometimes I eat the pumpkin cream filling like it’s pudding when no one is looking. 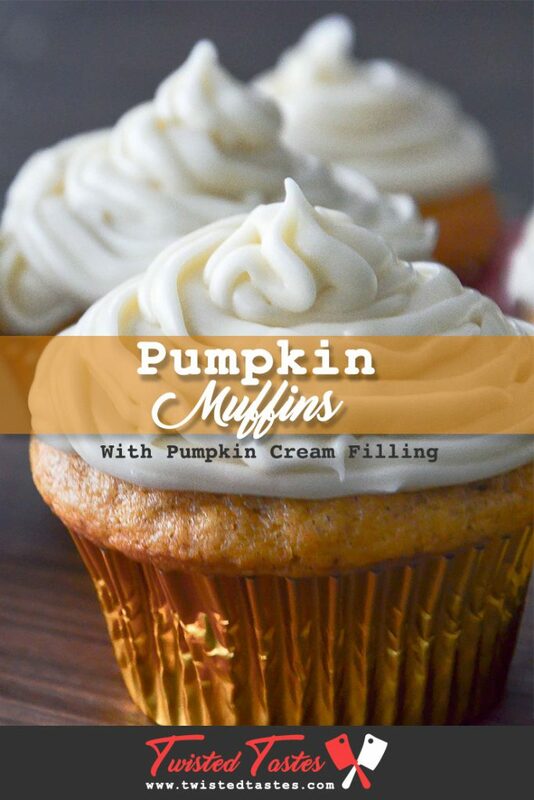 Wow, these Pumpkin Muffins are so cute! I would love to eat them for breakfast, lunch and dinner! Thank you for sharing this great recipe! I’m not usually a cupcake type of person. But since it’s the season and these look amazing I might be persuaded! I don’t blame you, Matt. I also like this as a muffin without the icing and some coffee.